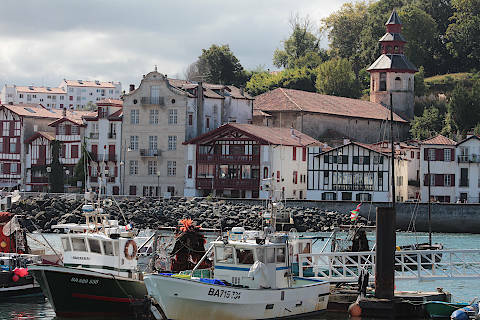 The town of Saint-Jean-de-Luz is a seaside resort in the Basque country of south-west France, on the coast near the border with Spain and about 20 kilometres south of Biarritz and Bayonne. 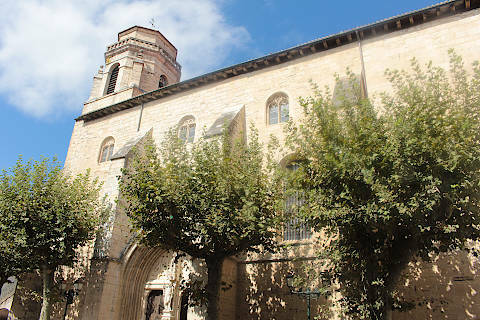 It is close to the western end of the Pyrenees so both hills and beaches are close to hand which makes Saint-Jean-de-Luz a popular centre for a visit to this region. 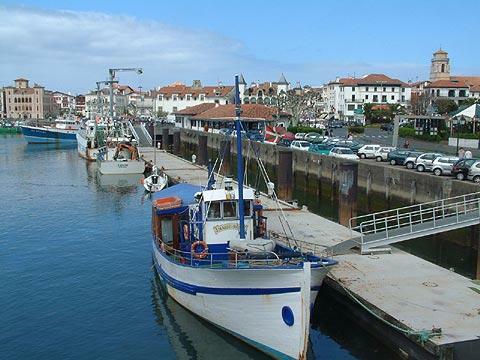 Saint-Jean-de-Luz is still an active fishing port, with anchovies, tuna and sardines being the main fish caught, although leisure and tourism now play a large part of the town's activity - not surprising, given the town's position between the Atlantic Ocean and the western Pyrenees. 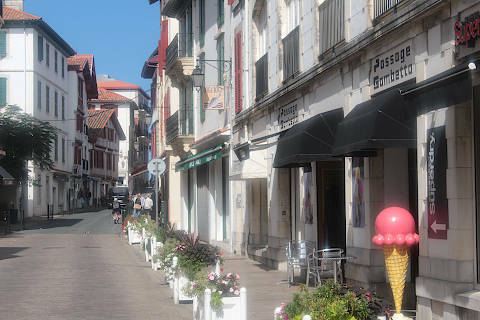 France This Way comment: Saint-Jean-de-Luz is one of our favourite seaside towns in south-west France (the others are Biarritz and Arcachon) because of its historic character and charm, its lively atmosphere, and the lovely beach in the town centre. Start a visit perhaps in the harbour area: this is a pretty harbour, with both a pleasure port and a fishing harbour. The small town you can see on the other side of the Nivelle river and the port is Ciboure, more or less part of Saint-Jean-de-Luz nowadays and one time home to Ravel and Matisse. 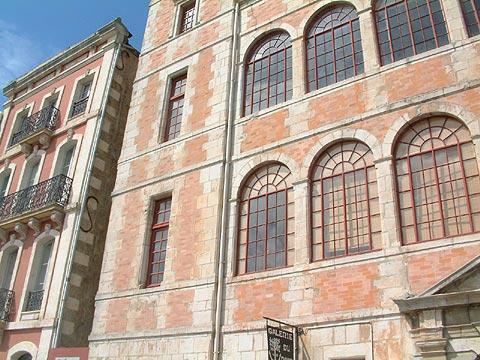 At the entrance to the harbour you can see a large imposing building with square towers on reach corner and built of brick and stone called the Maison de l'Infante: the galleries of arches make the facade interesting, although they are now closed with windows. 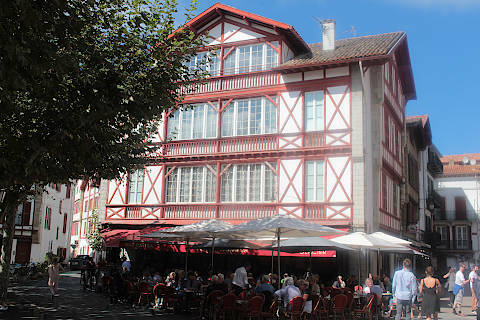 The building looks brand new but was actually built by the town in the 16th century as a present for a sea captain because of the wealth he brought to Saint-Jean-de-Luz. 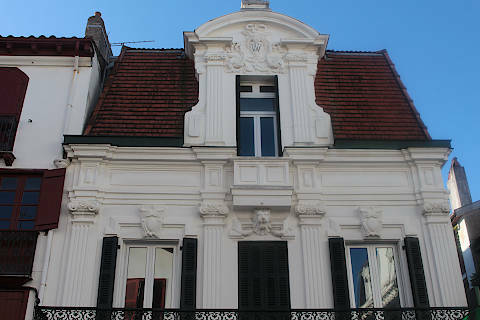 This house has played an important role in the history of the town: Anne of Austria stayed in the Maison de l'Infante in 1660 when she visited for the marriage of her son, King Louis XIV - the most important event in the history of Saint-Jean-de-Luz - as did Infant of Spain, the future Queen of France. 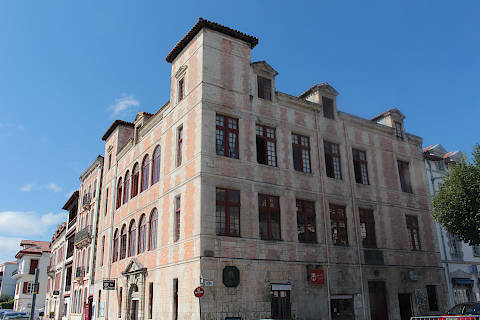 In 1701 the Dukes of Anjou, Berry and Burgundy stayed here on their way to Madrid, where the Duke of Anjou was to get married and become King of Spain. Just behind the Maison de l'Infante there is another important building called the House of Three Cannons. 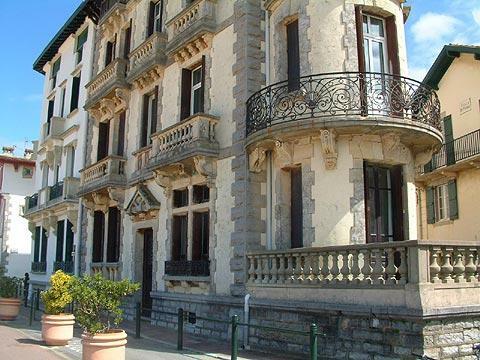 This is typical of houses owned by the wealthy of Saint-Jean-de-Luz in the 17th century although the facade was rebuilt in the 18th century. The three cannons on the facade are actually used to divert rain from the house, in the same way as gargoyles are used on churches. If you continue to follow the harbour towards the town centre you reach the Place des Corsaires. Take a look at the town hall as you pass: this was built in the 17th century but has been largely altered since then. 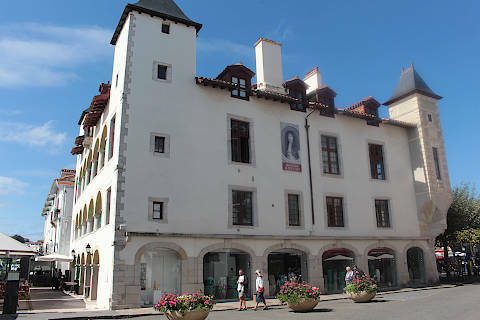 One of the most lovely historic buildings in Saint-Jean-de-Luz is the Maison Louis IV on the Place des Corsaires, built in the 17th century and with imposing square towers in each corner: note that the facades that overlook the Place des Corsaires and the Place Louis IV are very different in character. 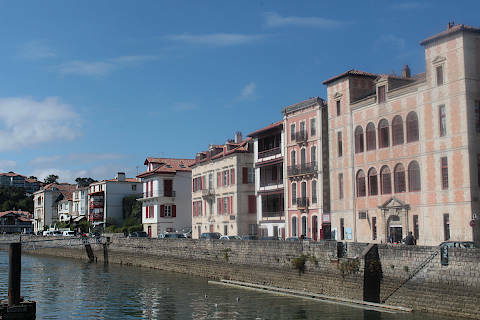 From here you can enter the old town of Saint-Jean-de-Luz. The Rue de la Baleine and the Rue de la Republique between Place des Corsaires and the beach are the main streets to find restaurants. The Rue de la Baleine takes its name from the 15th -17th century trade in whales: the local fishermen would force the whales onto the beach then kill them for the blubber, the bones and the ambergris. 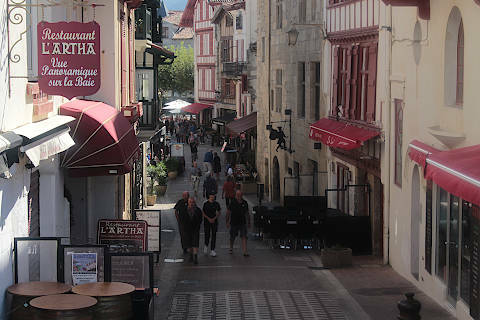 Despite this history the street is now one of the prettiest and liveliest in Saint-Jean-de-Luz! The main street through the centre of the old town is called the Rue Gambetta. In this area you will find a large number of small shops (many dedicated to tourists) and streets crammed with interesting houses and architecture as well as a wide choice of bars and cafes so allow plenty of time to explore. 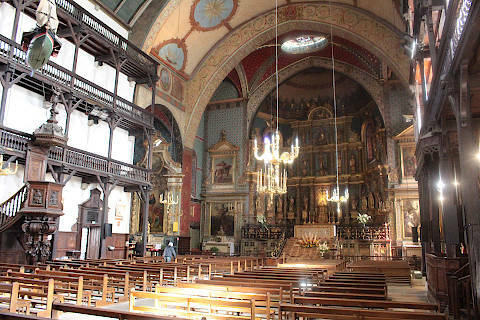 The Church of Saint John the Baptist in the centre of Saint Jean de Luz is among the historic highlights in the town and is a fine example of a Basque church, built in the 17th century to replace an earlier roman style church in the same location. 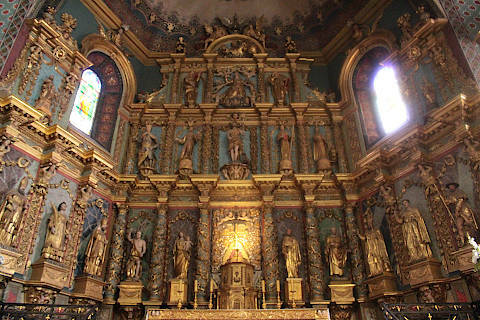 Inside the church there are typical basque style tiered wooden balconies running along on each side, and a very impressive 17th century altar with a great deal of gilding and statues. The blocked up church doorway you can see was closed after the wedding of Louis XIV and Marie-Thérèse (the most noteworthy event in the history of the church). After the wedding the doorway they had used to leave the church was blocked up to ensure that no-one else could pass by the same doorway. One more interesting building in the old town is the market hall, an imposing building from the 19th century. Lively markets are held inside the hall, and you will also find restaurants selling fresh produce. 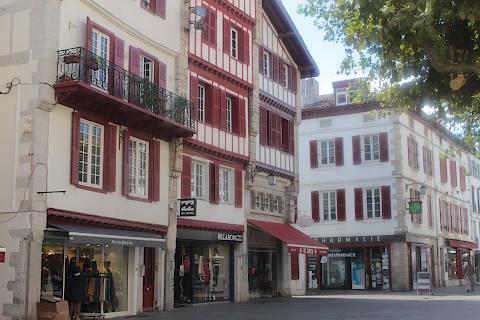 The Saint-Jean-de-Luz tourist office is close to the market hall, on Boulevard Victor Hugo. Having explored the harbour and the town centre you will certainly think it is time to see the beach! The entire northern edge of the town is along a long sandy beach and easily accessible from the harbour and old town. The sea is quite calm here because the town is in a natural harbour. We were lucky to able to spend one night of our stay in the Grand Hotel. This is a luxury hotel right next to the beach and with amazing spa and leisure facilities as well as a Michelin star restaurant. We could only afford one night here but the price was well worth paying if you are celebrating a speial ocasion: see Grand Hotel Thalasso and Spa for details. If you want a change from the beach there are plenty of other activities to choose from in or close to Saint-Jean-de-Luz, with golf and walking along the coast among the most popular. Golf near St Jean de Luz and Biarritz: The region is reputedly the home of golf in France, and there are many golf courses in the region. You could try Golf de Bassussarry, Golf d'Arcangues, Golf d'Epherra, Golf de Chantaco or Golf de la Nivelle. Or go to the Le Phare golf course, the oldest golf course in France. Walking: Walking is popular both along the coast and in the low hills and mountains at this end of the Pyrenees. One walk of particular interest is the coastal walk, that runs from Bidart to Hendaye, a total of about 25km. The path can be joined at Erretegia, Les Alcyons, Pointe Sainte-Barbe, the Fort de Socoa, Asporotsttipi, Abbadia and Sokoboru. Various information posts about geology, fishing and so on are found along the way. Cycling, quad-bikes, horse-riding and canoeing are other popular sports with visitors. 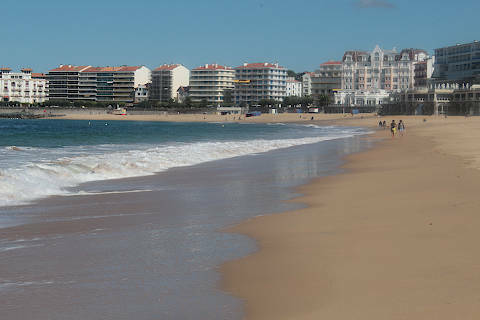 There are numerous other activities and things of interest in the St-Jean-de-Luz area - below is a brief summary. Abbadia: At Abbadia, on the road to Hendaye, there is a chateau - the Chateau d'Abbadia - which was constructed in the 19th century with a fine view across the ocean. Interesting, with an outside based on medieval chateaux and an interior decorated based on oriental designs, the owner (Viollet-le-Duc) also added an observatory so that scientists could map the stars (interestingly, he also drew the first accurate maps of Ethiopia). Abbadia is also home to a 65 hectare nature reserve, with 30 species of protected birds. Coast Road: The road south from St-Jean -de-Luz towards Hendaye (the 'corniche') is protected from development, and continues to Hondarribia and beyond. There are lots of viewpoints, cliff views and some beautiful countryside. Rhune train: Small train that runs up the Rhune mountain, where you are greeted by spectacular views in all directions. Trains leave from Ascain. See La Rhune railway. 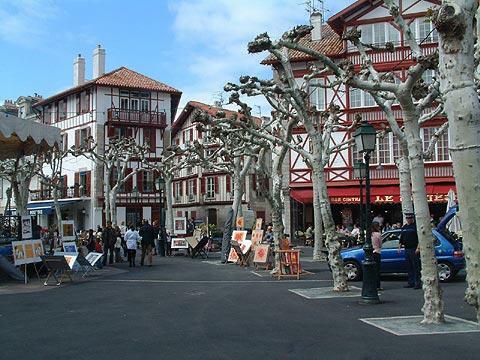 Hendaye: Heading towards Spain from St-Jean-de-Luz, at the end of the 'corniche' (coast road) you will find Hendaye. 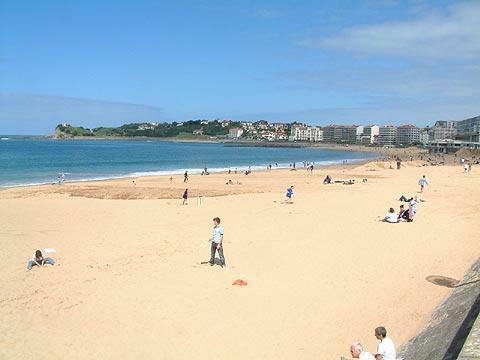 Hendaye has a very nice beach that is three kilometres long, a port and a small old town. One interesting feature of Hendaye is the nearby 'Ile des faisons' a no-mans-land island between France and Spain where treaties between the two countries were signed and hostage exchanges took place. Fort de Socoa: Just along the coast from Ciboure, Socoa has a nice quiet beach and a fort. The Fort de Socoa is also used as a base for watersports. A nice walk from Ciboure. Other: There are many other 'tourist attractions' - small museums, caves, houses recreated in middle-age style, aquariums etc etc You will find details in all the tourist offices in the area. At 3 km from the town the Chateau d'Arturbie is an attractive small castle dating from the 13th-17th centuries with a richly furnished interior and set in attractive gardens.